I love Zucchini’s. They’re so versatile. Do you have a garden where you harvest a half a ton of them in the summer?. Well this recipe will probably suit you. 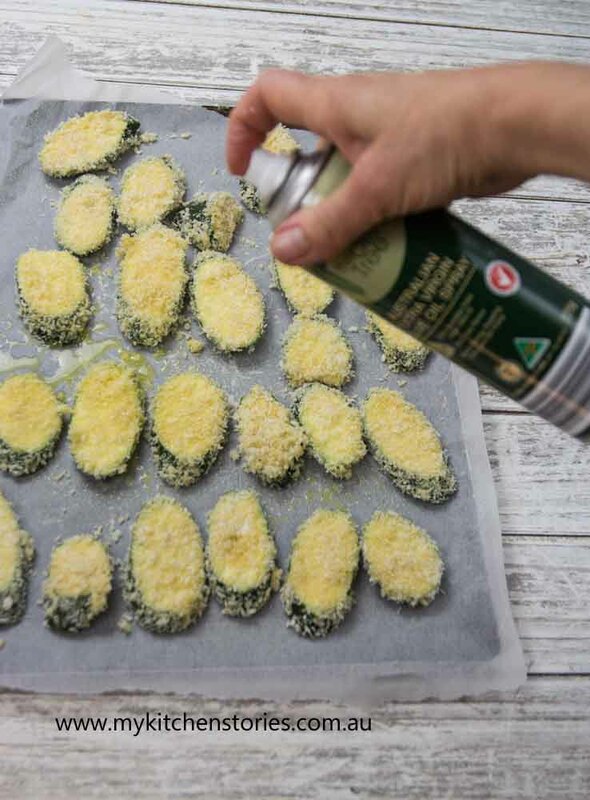 These lovely little zucchini chips make a gorgeous snack, a great canapé, something for a party or game day. Even something to nibble on before dinner. It’s quite simple really. These are oven roasted there is no frying. That’s the amazing thing. They are crispy and delicious and just as satisfying as chips and dips. All you need is some Japanese breadcrumbs, Panko. Do you know what they are? I use them a lot. Plain breadcrumbs aren’t really a substitute for them because they bake and cook to a very crunchy finish . This is what they look like. They can really vary in price between supermarkets so if you see them for only a couple of dollars a pack buy a few. I have seen them for up to 5.95 a packet, which incidently is highway robbery! 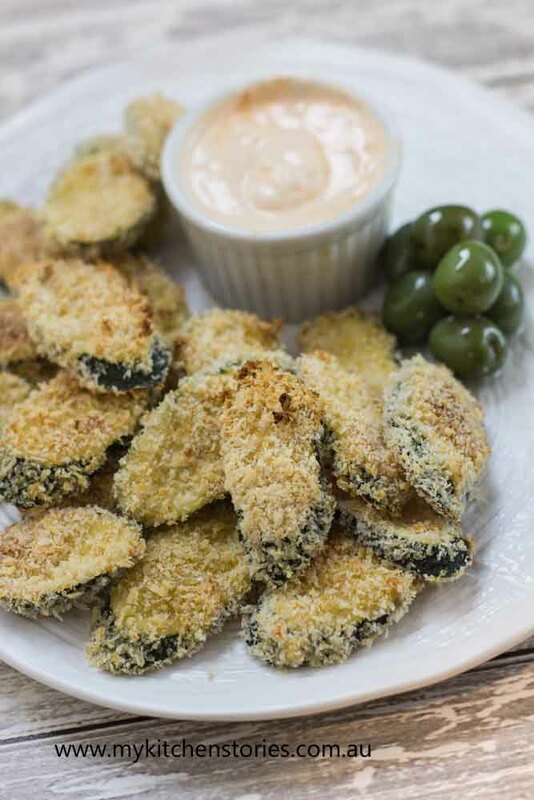 So with their Panko coats the zucchinis bake to a perfect golden crunchy finish. You can bake any other vegetable like this, or for that matter fish or even chicken. They could possibly be made gluten free by using rice crumbs as they have quite a crunchy nature too ( healthfood stores have these). Really though, this just may be one to skip for the gluten intolerant. Serve them alongside olives or anything else that you fancy for a nibble. I just love these though dipped in that smoky chipotle chilli sour cream. This is love for me. Make as many as you dare. 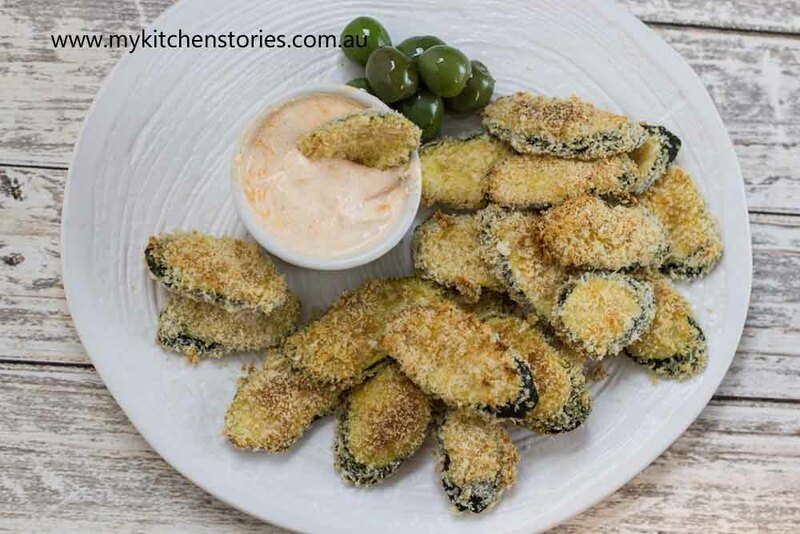 This recipe uses two medium sized Zucchinis which is enough for 3- 4 as an appetiser. Remember this recipe is for almost exactly 24 slices of Zucchini. Increase the recipe as you need. 2 Medium Zucchinis sliced diagonally They need to be thick enough to roast but not paper thin. Maybe a cm/ 1/4 inch. Prepare the baking tray with paper and spray well with olive oil spray ( or spread with a little olive oil) Line up all three along the bench. 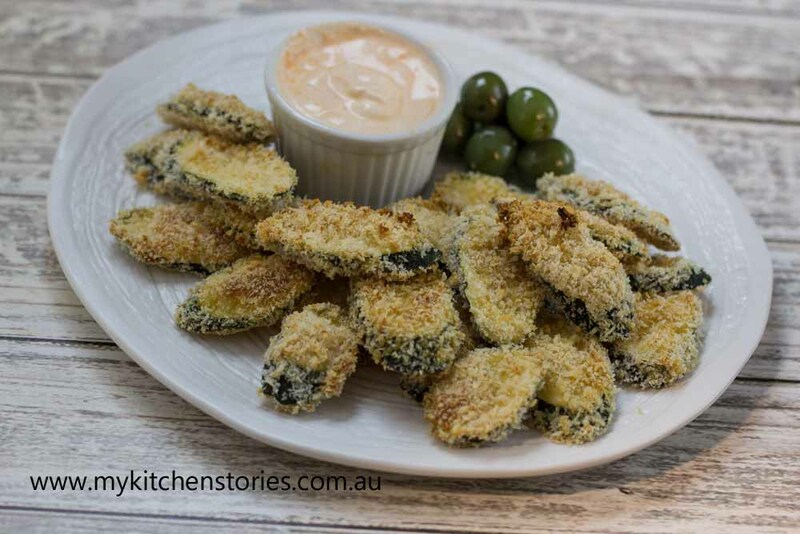 Next dip the zucchinis into the egg mix coating well. Roll them in the crumbs and place onto the baking tray, making sure they are not overlapping. Spray with a bit more oil them bake till golden. Ths should take 10 to 15 minutes depending on your oven. A fan forced oven will be quicker. Make the sour cream dipping sauce by mixing the sour cream with the chilli. Add more or less chilli to taste. 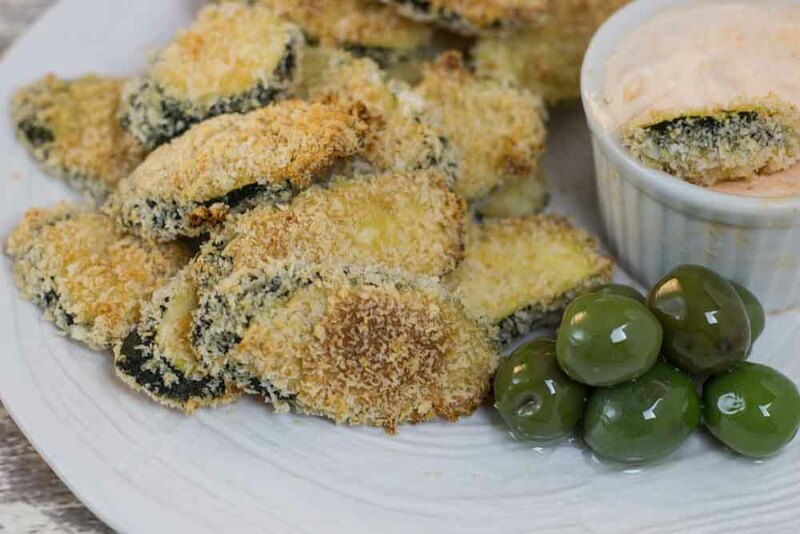 Love that these zucchini chips are baked, panko is my favorite crumb to use as well. Great recipe!! Hi Cheri. It is amazing that they bske up like a delicious fried morsel. What a great idea for zucchini! They look super crunchy and delicious. A great snack idea, Tania. Thanks Angie. Zucchini are my favs. It is funny how cauliflower has become the new “it” vegetable. I’m sure that zucchini will have its day in the sun soon! I’m a veggie lover so I enjoy zucchini. Your chips and dipping cream look delicious. Hi karen. am with you on that zucchini. thanks for dropping by. I know I know right. Cauliflower is so trendy and Panko are so expensive. go the zucchinis, they are the best, Charlie. Ooooh. That looks great! I’m going to bookmark this page. Thanks! Oh hi Leanne. Thanks for visiting. Hope you make them and enjoy them. Oh yum! I think zucchinis are massively underrated! My new favourite thing is Zucchini Oats or “zoats” in the morning. They’re super tasty! 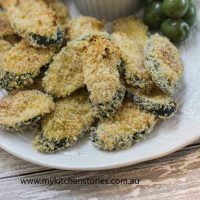 I love the idea of these zucchini chips and I’m a big fan of panko crumbs – they make great chicken schnitzel! Hi Sammie!. Yes I love Zucchinis aren’t they the best? I freaking love zuchinni – I haven’t done anything interesting with it recently but this sounds like a good (warm!) after dinner snack to me! I freakin lover that you have after dinner snacks…..
Yum! A friend made zucchini chips a little while ago, but didn’t use panko crumbs, I will definitely share your recipe with her! Thank you for posting your article. I found it interesting and nice !